Hva er Ukon No Chikara? | Ukon No Chikara - no more hangovers - world wide free shipping! Ukon No Chikara is a popular drink (powder, pill etc) from Japan. Once consumed a hangover after a night out drinking can be prevented. 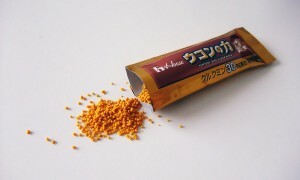 Ukon No Chikara is made of the root of the Turmeric plant. Turmeric has a stimulating effect on bile fluid production and therefore helps in reducing alcohol levels in the body much quicker. Due to this stimulation a hangover can be prevented after drinking alcohol.